Warhol was captivated by consumerism. Warhol created art from everyday images of consumer goods. Themes in his Ad portfolio include glamour, memories from childhood, celebrities, and even corporate identities. Pop Art was an experimental form of art. Warhol, the "Pope of Pop", turned to this new style, where popular subjects, such as commercial advertisements, could be part of the artist's palette. His early paintings of abstract expressionism showcase advertisements, hand-painted with paint drips. Eventually, Warhol removed the evidence of his artistic "hand" completely. Campbell's Soup Cans': Consists one of each of the canned soup varieties Campbell's offered at the time. Campbell's Soup Cans' was a catalyst for pop art. Irving Blum was the first art dealer to showcase Warhol's Campbell's Soup Cans'. It was to be Warhol's first solo gallery exhibit, and Pop Art's premiere on the West Coast. Controversy spread concerning the attempt to recreate the look of manufactured objects. Blum bought back the few canvasses that sold; agreeing with Warhol's vision of them as a set, and bought them from Warhol for $100 a month for 10 months. 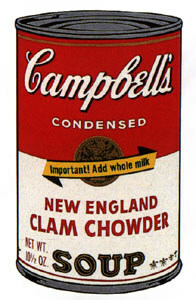 It is well accepted that Warhol was inspired to paint Campbell's Soup Cans' due to a suggestion from Muriel Latow, the same friend who suggested Warhol's Dollar Signs. Warhol was quoted saying, "I used to drink it, I used to have the same lunch every day, for twenty years".